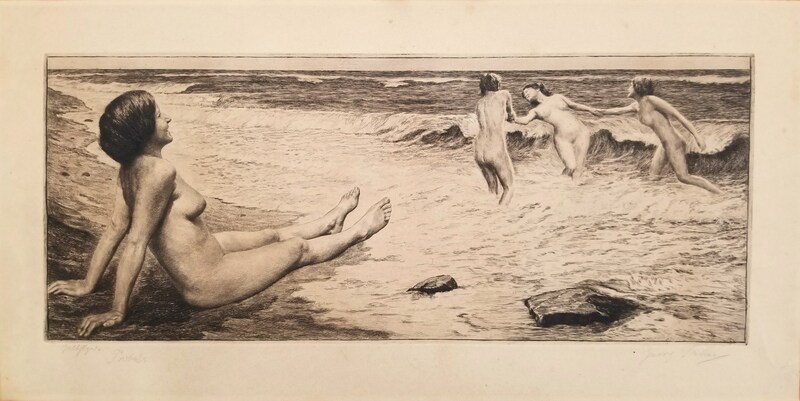 Title: "Bathers in a Grotto"
Framed size: 31" x 30.5"
Image size: 15.5" x 15.75"
Painter and print maker Georg Jahn (1869 - 1940) was born in Meissen. He studied at the Academy of Fine Arts in Dresden during a period of intense artistic ferment, a struggle between classical and emerging styles. The dispute came to a head with a scathing critique of Dresden's artistic contributions to the International Art Exhibition at Berlin in 1891, resulting in the growing tolerance of wider artistic experimentation and the formation of the secessionist Dresden Association of Visual Artists, in which Jahn played a significant role. He enjoyed a long career as a painter and print maker producing some 350 etchings. He died at Loschwitz. Framed size: 22.25" x 34.5"
Image size: 8.75" x 21.5"